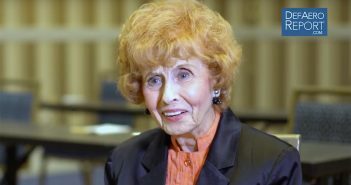 Elinor Otto, the nation’s longest-working Rosie the Riveter and a 2017 Air Force Association Lifetime Achievement Award recipient, discusses the challenges of balancing single motherhood with work as a Rosie the Riveter, life during wartime, getting recruited for an aircraft industry job at age 95 and what AFA means to her during Part 3 of her interview at AFA’s 2017 Air, Space & Cyber conference and trade show near Washington. 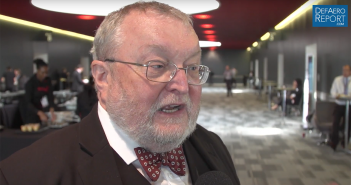 The Defense & Aerospace Report’s coverage is sponsored by L3 Technologies and Leonardo DRS, and this interview is in partnership with AFA. 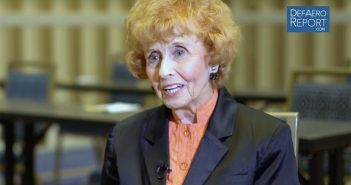 Elinor Otto, the nation’s longest-working Rosie the Riveter and a 2017 Air Force Association Lifetime Achievement Award recipient, discusses what the honor means to her, how she entered the aerospace industry and her experience working at the Rohr Aircraft Coproration during Part 1 of her interview at AFA’s 2017 Air, Space & Cyber conference and trade show near Washington. Otto, a first-generation Rosie the Riveter, worked in the aircraft business for 68 years, until she was laid off by Boeing in 2015. The Defense & Aerospace Report’s coverage is sponsored by L3 Technologies and Leonardo DRS, and this interview is in partnership with AFA. 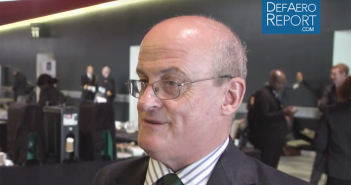 Eric Grove, PhD, naval historian and international security analyst, discusses the feasibility of the Royal Navy’s future plans in the midst of British defense budget issues with Defense & Aerospace Report Editor Vago Muradian during a Sept. 11, 2017, interview at the 2017 Defense and Security Equipment International conference and trade show. 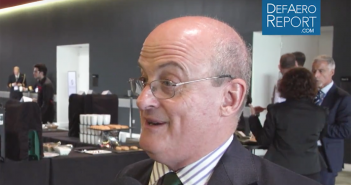 Defense & Aerospace Report is covering the event in partnership with DSEI and Clarion Events. Is your military history knowledge up to snuff? Test your defense trivia skills with mini challenges from world-renowned experts in attendance — like Brig. 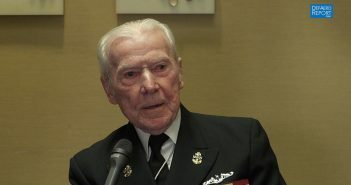 Ben Barry, British Army Ret. — at the 2017 Defense and Security Equipment International conference and trade show. If you think you know the answer to a challenge, tweet it to us @defaeroreport using hashtag #DSEI for your chance to win. Defense & Aerospace Report’s event coverage is being produced in partnership with DSEI and Clarion Events. Is your military history knowledge up to snuff? Test your defense trivia skills with mini challenges from world-renowned experts in attendance — like Defence Analysis Editor Francis Tusa — at the 2017 Defense and Security Equipment International conference and trade show. If you think you know the answer to a challenge, tweet it to us @defaeroreport using hashtag #DSEI for your chance to win. 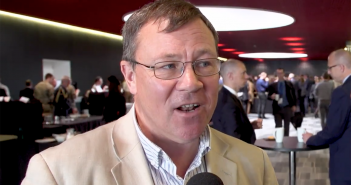 Defense & Aerospace Report’s event coverage is being produced in partnership with DSEI and Clarion Events. 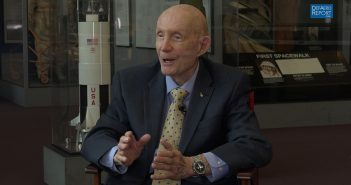 In the first installment of Defense & Aerospace Report’s exclusive, multi-part interview with Lt. Gen. Tom Stafford, USAF Ret., former NASA astronaut and former US Air Force acquisition chief, Stafford discusses what inspired him to fly, why he went to the United States Naval Academy and why he joined the US Air Force after graduation. The interview was filmed at the Smithsonian’s National Air & Space Museum in Washington on July 20, 2017, the 48th anniversary of the United States’ 1969 lunar landing. 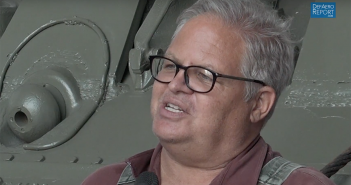 Tom Czekanski, senior curator and restoration manager at the National World War II Museum in New Orleans, discusses why he feels D-Day was the most pivotal moment of World War II during an interview with Defense & Aerospace Report Editor Vago Muradian. Former US Navy Chief Gunner’s Mate Henry “Hank” Kudzik, the last surviving crew member from the USS Nautilus (SS-168), shares his experience during the Battle of Midway during which his boat sank one of the Japanese aircraft carriers that attacked Pearl Harbor, as well as two other warships, with Defense & Aerospace Report Editor Vago Muradian during a June 5, 2017, interview held in Arlington, Virginia. Between May 1942 and August 1945, Kudzik completed 14 war patrols, eight aboard Nautilus and six aboard USS Gar (SS-206). 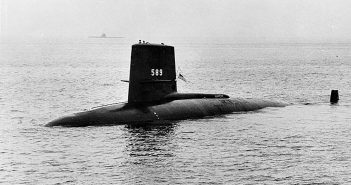 On May 22, 1968, the American nuclear attack submarine USS Scorpion, went missing with 99 men aboard on her way back to Norfolk, Virginia. Scorpion left New London, Connecticut, in February 1968 with a goal of reaching the Mediterranean Sea for a two-month European deployment, the Naval History and Heritage Command writes. However, they continue, she last radioed her position on May 21, 1968. She was lost southwest of the Azores, a group of islands about 950 miles west of mainland Portugal, on May 22, the US Navy reports.